We are a small group of engaged people, infected by the virus to look at, collect, produce and like printed and digital atlases! The Commission on Atlases is a subsidiary part of the International Cartographic Association ICA. It was initiated in 1985 by some brave men… and is since then dedicated to promote and support all kind of atlases. We are engaged in research, development and production of atlases; in particular, we want to focus on smart solutions and new approaches for printed and digital atlases. The ICA Commission of National Atlases was created 1987 at the General Assembly in Morelia, Mexico on a proposal from the Swedish Cartographic Society supported by the Dutch Cartographic Society with Bengt Rystedt, National Land Survey of Sweden as the chairperson. The board of the commission was then extended with Eva Siekierska, Natural Resources, Ottawa, Canada as vice-chair, Ferjan Ormeling, Utrecht University, The Netherlands and Timothy Trainor, US Census Bureau, Washington DC, USA. Professor Gylfi Mar Gudbergsson, Iceland, and Nico Bakker, Topographic Survey, the Netherlands, were also for many years’ valuable members of the board. Figure 1. The extended ‘gang of four’. One year before, in London, Bengt Rystedt had organized, at the AutoCarto meeting in London, a workshop on national atlases, and this proved so successful, that ICA instituted an ad-hoc working group on National atlases. As the joint IGU-ICA Working Group on Environmental Atlases had moved in another direction, and was discontinued in 1987, this gave room for the ICA to start its own Commission on National Atlases. The Commission convened a first meeting in in Stockholm and Kiruna, Sweden in March 1989. The invitation to the meeting was spread widely and attracted some 30 persons from 11 countries. The ICA Vice-President Arpad Papp-Váry, Hungary attended as the representative of the ICA Executive Committee. Outside the scientific program the city of Kiruna offered a dinner in the City Hall and the company that had installed an advanced colour plotter to the atlas production unit in Kiruna invited the participants to outdoor activities with dog sleds and snow scooter trips. The meeting in Kiruna was very efficient and joyful, setting a good standard for following meetings. Figure 2. 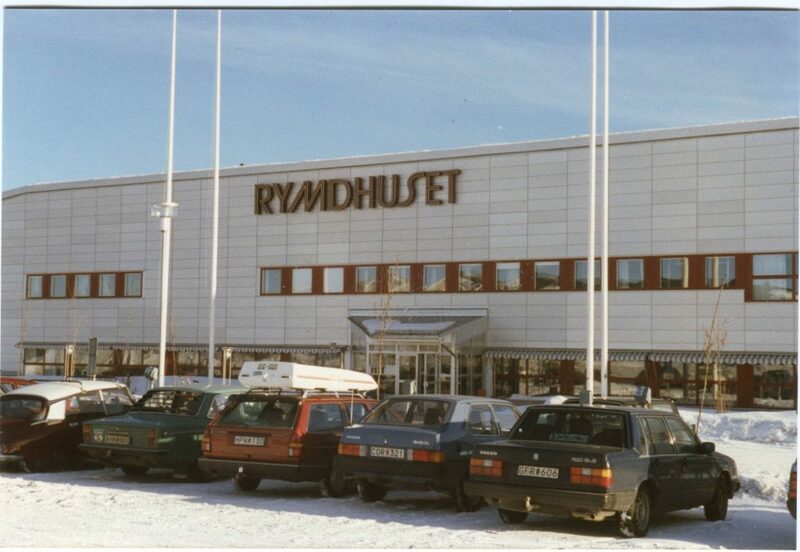 The Rymdhuset in Kiruna, where the first commission meeting was held in 1989. The development of an atlas needs geospatial data, topographic topological background maps and one or more editors with cartographic knowledge and with the skills to produce thematic maps. Professor Stig Jaatinen, editor of the 5th version of the Finnish National Atlas, once said that being an editor of a national atlas is a patriotic duty for a free and independent country. That is a good summary and a national atlas is something you should be proud of. A national atlas shall give authoritative information on a nation’s population, natural resources, industry and economics. Fig 3. 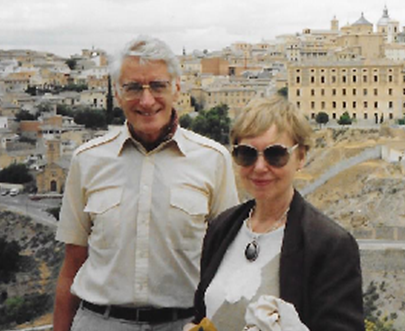 Stig and Anita Jaatinen in Toledo, 1992. Serve as a source of information for ICA member countries producing or preparing production of national atlases with new techniques. Identify technical facilities and their current use in national atlas production. Identify possible gaps in the new technique. Encourage further development of national atlas production. Present a report on the current situation in 1989 and a final on the findings in 1991. The terms of references for the commission have been extended over the years. At the 2nd commission meeting in 1990 in Beijing, China, terms of reference on National Atlas Information Systems and on Electronic and PC- Atlases were added. These topics became very important in later years. In 1991 the ICA General Assembly in Bournemouth UK added “regional atlases” to our tasks, but we are not sure whether we implemented that decision. In 1995, when Bengt Rystedt became ICA vice-president, Timothy Trainor took over the chairmanship of the commission, a task he continued for 12 years. It should also be noted that a discussion with the geography representative of the Swedish Royal Academy of Science resulted in the Swedish proposal to IGU (International Geographical Union) that it should establish an atlas commission as well, at the next IGU international geographical conference. However, the IGU board of directors rejected that proposal and decided to include atlases in the terms of reference of its Commission on GIS. That was a pity, since the IGU GIS Commission at that time got so many new tasks that the developments of atlases more or less were snowed under and this put a heavier burden on the ICA commission. It should also be known that IGU had a commission on National (and Regional) Atlases, which from 1956-1972 was chaired by Professor K. A. Salishchev (Salichtchev, 1969), Moscow State University, Russia. He worked on the development of thematic cartography and as he was president of ICA 1968-1972, so his commission was regarded by the geographers as an ICA commission. He received the Mannerfelt gold medal 1981 and a summary of his bibliography can be found at the ICA homepage. The original terms of reference for his commission were: to promote the production of national and regional atlases, to standardise the legends of the main maps, to continue the systematic analysis of published national and regional atlases, and to keep up to date the bibliography of published national atlases. Under his chairmanship his commission produced some fundamental texts such as Atlas nationaux (1960), Regional atlases (1964) and Complex regional atlases (in Russian, 1976). In 1972 Salishchev stepped down as chair and Prof Edgar Lehmann (Leipzig, GDR) took over (1972-1976), and under his chairmanship the emphasis was put more on environmental and urban atlases. This commission was discontinued in 1976 and in its place IGA and IGU started a joint working group on environmental atlases, chaired by Francisco Vasquez Maure (Madrid), with the tasks to assemble and establish documentation regarding environmental atlases and maps in national, regional and urban atlases, to analyse systematically these environmental maps and atlases, in order to be able to recommend guidelines in the production of environmental atlases, and to publish the results of these endeavours. Ferjan Ormeling was appointed documentalist of this working group (1976-1984). In 1980 its tasks were extended by the inclusion of exploring the development of databases for environmental factors. In 1982, when Vasquez Maure died, David Bickmore took over as chair, and when in 1984 his working group was continued, it was under the title of Joint IGU-ICA WG on World digital databases for environmental science. It was discontinued after 1987. 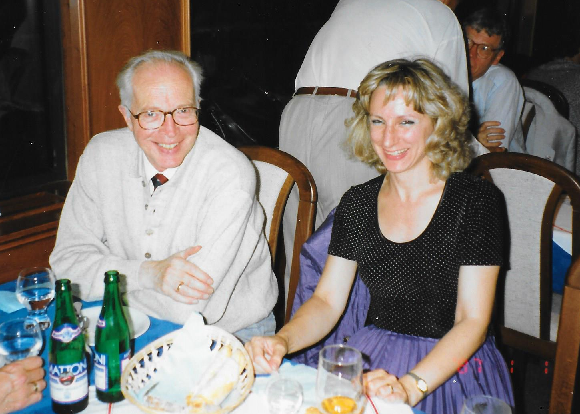 In the meantime, Professor Bogodar Winid, Warsaw, who had been a corresponding member of Salishchev’s commission from 1956 onwards, during the period 1980-1984 chaired an ICA commission on Thematic Cartography. The terms of references for his commission included: 1. to survey the specific cartographic aspects of graphical production of national, regional and urban planning maps and 2. to prepare and to publish a bibliography of atlases for national, regional and urban planning. He presented a report on his finding at the third National Atlas commission meeting in Leipzig, DDR, in May 1991 (Winid, 1991). During the preparation of his paper he studied more than 200 different atlases to find out how they were used. His general findings were that their use by politicians was restricted and that atlas use in schools also was very limited. He also pointed out that international organizations and national atlas commissions could be helpful to improve the use of these atlases. The commissions on thematic mapping have been important for atlas cartography. One of the first attempts taken by Professor Sándor Radó (Hungary) in 1976 was to produce an environmental atlas for the above-mentioned joint IUG-ICA Working Group on Environmental Atlases. In 1980 at the ICA Assembly in Tokyo it was decided to discontinue the ICA commission on thematic cartography. Instead, a new commission on “Thematic Mapping by the Aid of Remote Sensing” was established chaired by Professor A. Ciolkosz (Poland). The commission reported their findings in 1984 and the chairmanship was that same year taken over by France. Nowadays, there is no ICA commission in thematic cartography neither in satellite cartography. The first attempt to produce an electronic atlas was presented at the ICA International Conference in Morelia, Mexico in 1987 (when also the ICA National Atlas Commission was instituted) by Richard Smith with the paper Electronic Atlas of Arkansas. It was soon followed by the Canadian Electronic Atlas (Siekierska and Palko, 1987) within the Canadian National Atlas Information Service. After extensive evaluation of the system by potential users, a decision was taken to further develop the system capabilities and to upgrade the prototype into a full-capability production system. The Canadian Electronic Atlas was a system for cartographic presentation of National Atlas information using a computer screen as the primary medium for data display. The computer display facilitated several modes of data presentation not possible in conventional cartography. It was particularly suitable for presentation of time-dependant geographical processes for presentation in a dynamical form on the screen using animation techniques. The Canadian Electronic Atlas extended the capabilities of atlas readers, but continued to rely on the intelligent and creative interaction of the readers with the atlas They were given a number of efficient tools to explore spatial relationships and to draw conclusions. The users could also retrieve additional statistical data associated with map elements, efficiently correlate large number of variables and validate the conclusions using statistical tests. The Canadian Electronic Atlas was based on a GIS concept providing extensive capabilities for information retrieval. Additionally, the design incorporated a wide range of cartographic functions needed for the creation and design of high quality electronic maps and for the performance of interactive cartographic analysis. The Canadian Electronic Atlas also provided several capabilities for assigning colours to particular map elements. Colour manipulation can be static, meaning that individual colours may be selected, or it can be dynamic, meaning that the user selects start and end colours from a given scale and all intermediate colours are calculated automatically by the system. Manipulation of colours in the Canadian Electronic Atlas also allowed for using special effects such as animation or blinking of selected features on the screen. The Canadian Electronic Atlas was later developed into the Canadian National Atlas Information System including both geospatial information, tools for construction of maps and equipment for printing maps. Figure 4. 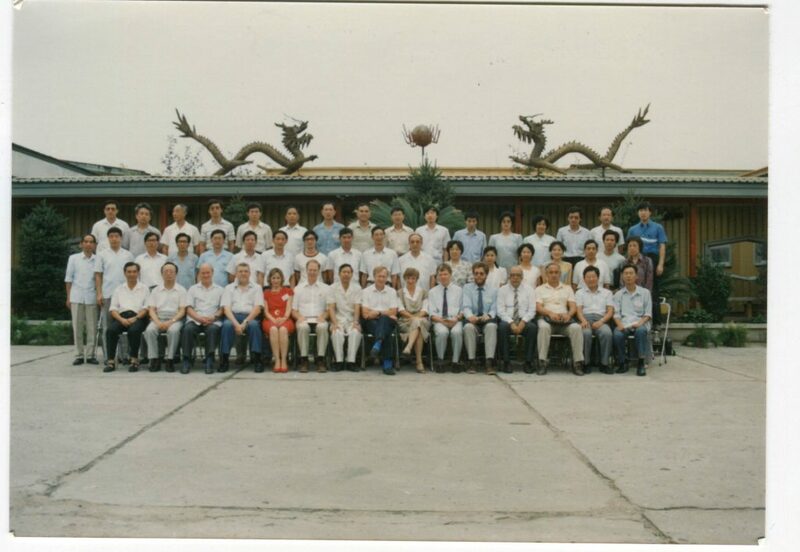 Participants, second commission meeting, Beijing 1990. Figure 5. Meeting in Leipzig at the Institut für Landerkunde (1991). During the second commission meeting, held in Beijing 1990, Liao Ke, director of the State Cartographic Publishing House, had staged an impressive overview of Chinese national and regional atlas production (Trainor 1991). 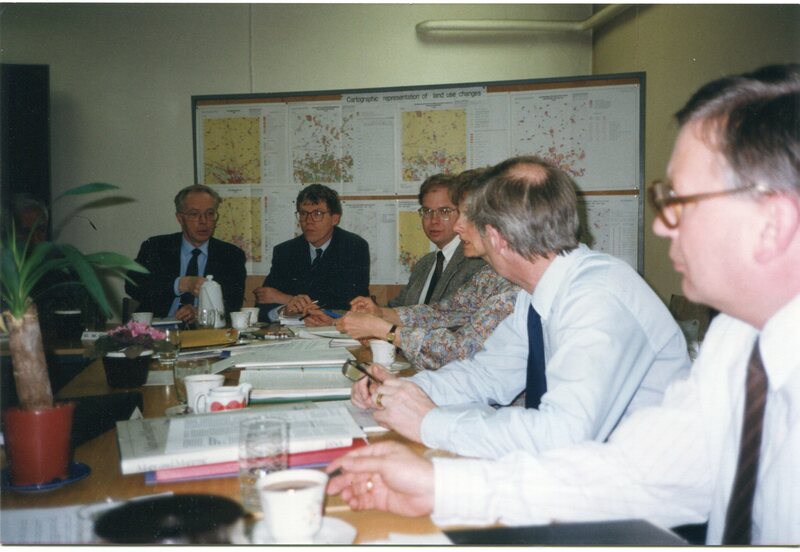 The third meeting in Leipzig (1991) made us aware of the status of (national) atlas cartography in Eastern Europe, and was also devoted to a discussion of the ideas of producing a national atlas covering the recently united East and West Germany. The technical and personnel difficulties encountered in the process created a need for the cartographers to adapt to the new techniques and of a revision of concepts in the compilation, presentation and updating of the Atlas. Figure 6. 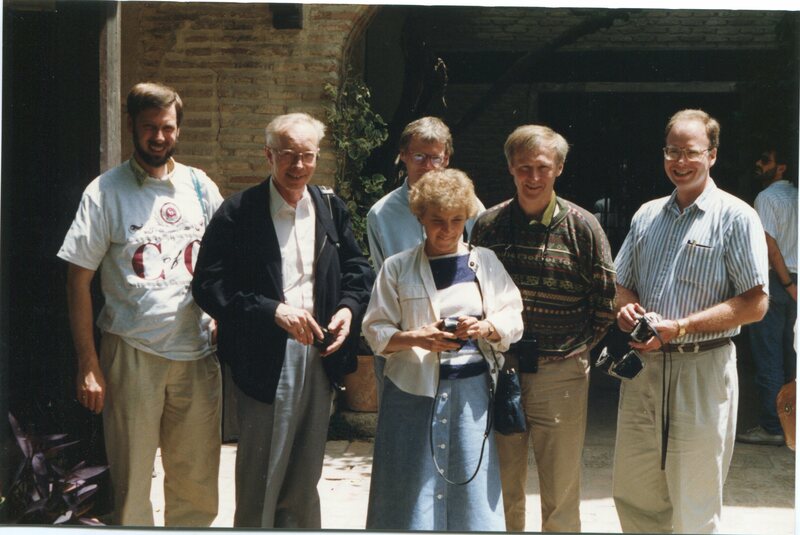 Gylfi Mar Gudbergsson and Lola Abad at the fourth national atlas commission meeting in Madrid, Spain 1992. The best-known PC-atlas is the Swedish PC-Atlas developed by Wolter Arnberg at the Department of Physical Geography, Stockholm University, Sweden with assistance from Bo Justusson, National Census Bureau, Stockholm, Sweden. This PC-atlas was intended to be an introduction to geographical information systems, to support the digital processing of maps and geospatial data in schools, and to be a supplement to the atlas books as well as a stand-alone system. It was meant to be used in planning and administration at local, regional and national levels and also in education and research, and had tools for downloading geospatial information from the atlas books stored as Arc-Info-files at the Kiruna map production centre, tools for producing thematic maps that could be foreground information on background topological maps already stored in the system. The software of the PC-Atlas had three different levels. The first level was simple for the novice users. The second one was for more advanced users and the third one for expert users allowing them to produce their own atlases. Figure 7. 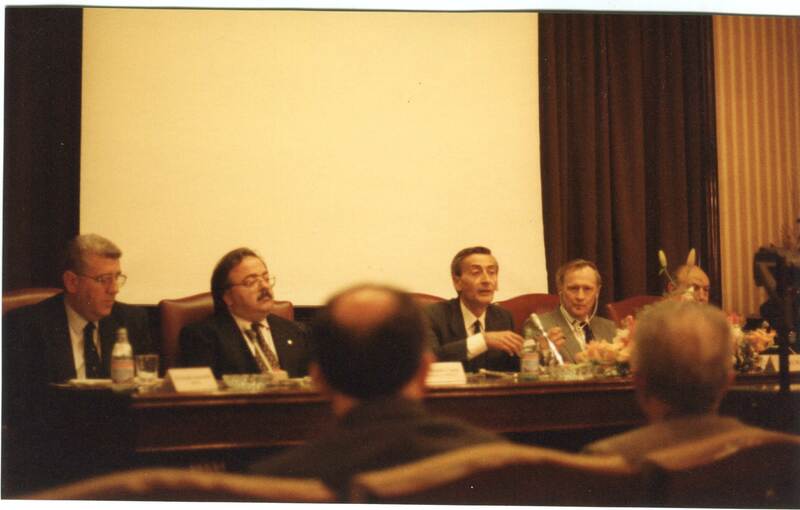 Opening of the fourth, Madrid meeting (1992), with, from left to right Fernando Aranaz, Jaume Miranda, The General Director of IGN Spain, Bengt Rystedt and Rodolfo Nunez de las Cuevas. In 1993 the commission started to have joint meetings with other ICA commissions, in order to profit from the expertise of these other commissions as well. Favourite commissions for joining our meetings would prove to be, over time, the ICA Map Use commission chaired by James Carter, the ICA Education and Training commission and the ICA Map production commission, chaired by Sjef van der Steen. Figure 8. Participants at the -probably most successful – commission meeting, at Visegrad, Hungary, 1993. The sixth meeting was held as a special session of the 1994 ASPRS/ACSM Annual Convention in Reno, Nevada, USA. Since the meeting was held in the end of April it was just two weeks after the famous executive order issued by President Clinton on establishing a National Spatial Data Infrastructure for the United States of America. Although Netscape had not been launched yet ICA president Joel Morrison presented the idea that the next edition of the US National Atlas should be an Internet Atlas. The session is documented as a special issue of the journal Cartographic Perspectives. Here for the first time we were confronted with atlas authoring systems, that is sets of computer programs that aid in the construction of electronic atlases – this particular system being developed by Richard Smith at Arkansas University at Fayetteville and President of Electromap, Inc.
By the end of the commission’s second term the focus of the commission had shifted from electronic atlases to national atlas information systems. Atlas Information Systems (AIS) are computerized geographic information systems related to a certain area or theme in conjunction with a given purpose – with an additional narrative faculty, in which maps play a dominant role [Elzakker). Combined with the national atlas concept, it would result in a national atlas information system (NAIS). Although they were unable to get the funding for developing such a system for the Netherlands, a research group consisting of Corné van Elzakker, Barend Köbben, Olev Koop, Menno-Jan Kraak and Ferjan Ormeling (from Utrecht University and ITC) contributed much to the theoretical background for such a NAIS. They especially described how to integrate such a system in the national geospatial infrastructure, so that it could be used as NGSI-portal. They defined the concepts, such as early definitions of static, interactive and analytical electronic atlases, and Atlas Information Systems. 1) Promote and support the design, production and use of atlases and atlas information systems by demonstrating design and production applications of national and regional atlases, and by documenting guidelines and procedures for the design and production of global, national and regional atlases via the internet and, where applicable, CD-ROM, DVD, and printed proceedings. 3) Encourage efforts for integrating data for the development of electronic atlases and national and regional atlas information systems by acknowledging requirements for diverse geographic and temporal data themes; and identifying and exploring various options and issues for data integration. Figure 9. 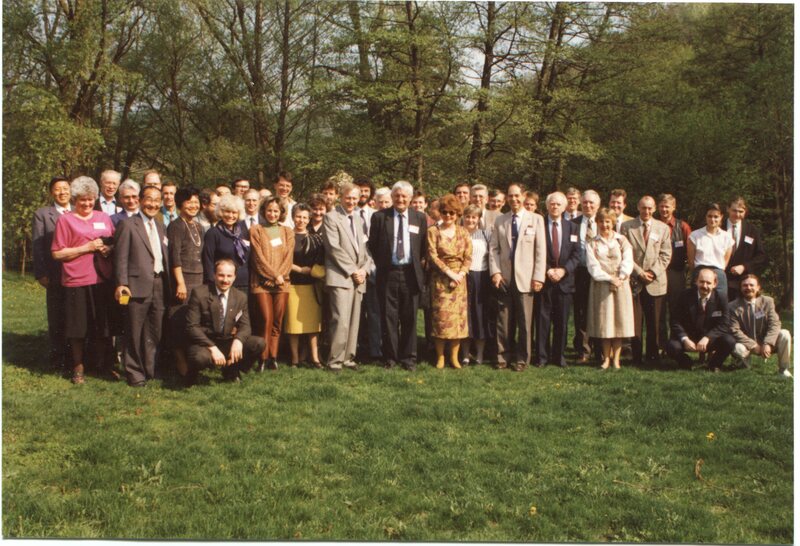 The seventh national atlas commission meeting in Prague, Czechia in 1996. The information dissemination role of the commission was realized at the 7th meeting held in both Prague and The Hague, as in The Hague the commission offered a special digital atlas session to the participants of the 28th International Geographical Conference that was held there, in which they demonstrated the new digital atlases. 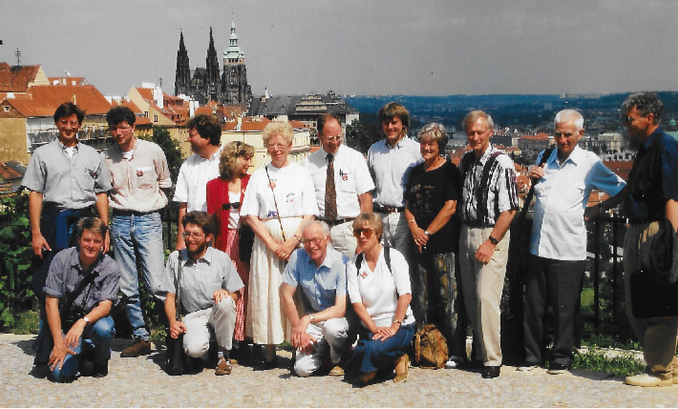 On the way from Prague to The Hague, in the minivan that transported commission members from the Netherlands, Canada and the US, Barend Köbben produced the first website of the commission. Educational aspects of national and regional atlases were dealt with at the eight meeting, in Bandung in 1997, where the production of school atlases as spin-off from national atlases was discussed, with a large audience of geography teachers. ICA-president Michael Wood also attended, and during the seminar the Indonesian Cartographic Society was launched by the enthusiast participants. Atlas use aspects were an important aspect of the seminar held in Reykjavik (1998), as here Bruce Wright from the USGS commented on the contributions of focus groups, questionnaires and prototype testing (on-line user feedback) for deciding on the contents of national atlases, a concept that had not been tried before regarding national atlases. The second seminar in Beijing (2001), this one on the eve of the 20th International Cartographic Conference, was an impressive demonstration of the enormous progress made in the previous decade in national atlas production in China, which had turned digital. The commission seminar held together with NATMO, the Indian national atlas organization in 2003 in Kolkata, showed us how, since India’s independence in 1947, national atlas production had been embedded in Indian society and had played a major role in national planning. 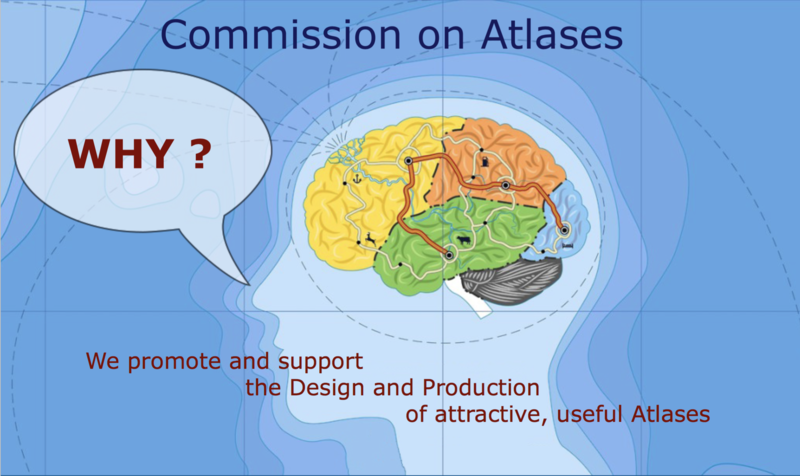 Of course, apart from the separate special meetings of the atlas commission, it also played an important role in the international cartographic conferences, where on the average some 20-30 papers on atlas production would be presented in dedicated sessions. In later years, apart from the impressive national atlas discs from Switzerland, Germany and the Ukraine, the focus shifted to web atlases, such as the Canadian National atlas system and national and statistical web atlases from European countries. Instead of concepts, the functionality of these atlases became the main topic, trending towards their usability. The need to disseminate the knowledge about atlas production also became apparent, and that is why the production of an atlas cookbook was inserted in the terms of reference for Timothy’s successors. The commission continued to be chaired by Peter Jordan (Vienna, 2007-2015) and René Sieber (Zurich, 2015- ), but that is recent history. Aranaz, Fernando and Maria Dolores Abad Moros (eds.) (1993) Proceedings of the ICA National and Regional Atlas Commission Meeting, May 18-22, 1992. Comunicaciones y Ponencias num. 10, Direccion General del Instituto Geografico Nacional, Ministerio de Obras Publicas, Transportes y Medio Ambiente, Madrid, Spain. Gylfason, Agust, Barend Köbben, Ferjan Ormeling and Tim Trainor (1999) Proceedings of the seminar on Electronic atlases and national atlas information systems in the information age, held at the University of Iceland, Reykjavik 1998. Enschede: ITC. Klinghammer, Istvan, Ferjan Ormeling and Laszlo Zentai (1993) Proceedings of the seminar on Electronic Atlases, held at Eötvös Lorand University, Visegrad, Hungary, April 27-29, 1993. Budapest: Cartographic Institute ELTE. Liao Ke and Timothy Trainor (1991) Proceedings of the ICA National Atlases Commission meeting 1990 Beijing. Beijing: China Cartographic Publishing House. Ormeling Sr, Ferdinand J. (1987) ICA 1959-1984 The first twenty-five years of the International Cartographic Association. Printed at ITC, Enschede, The Netherlands. ISBN 90-70310-11-2. Ormeling, Ferjan, Klaas Villanueva and Tjeerd Tichelaar (eds.) (1998) Atlas Production for Southeast Asia. Vol 2 of the Proceedings of the International Workshop/Seminar “Modern Cartography for Navigating the Information Highway” held in Bandung, Indonesia March 3-14, 1997. Enschede: ITC. Rystedt, Bengt (1989) Papers presented at the first meeting of the Commission [on National atlases], Stockholm/Kiruna, Sweden – March 11-15, 1989. Rystedt, Bengt (1993) Technical and Organizational Approaches to National and Regional Atlas Production. Paper presented to the Fifth United Nation Regional Cartographic Conference for the Americas in New York, 11-15 January 1993. Rystedt, Bengt (1995) The Commission on National and Regional Atlases from 1987-1995. Report to the ICA General Assembly in Barcelona. Salichtchev K. A. (1969) The Present-Day Thematic Cartography and the Tasks of International Collaboration. International Yearbook of Cartography, Vol. IX, pp. 19-29. Siekierska E. and Palko S. (1986) Development of the Electronic Atlas of Canada. Computer Handling and Dissemination of Data, CODATA, 1987, Elsevier Science Publishers B. V., Netherlands, pp. 308-312. Smith R. (1987) Electronic Atlas of Arkansas: Design and Operational Considerations. Proceedings of the 13th International Cartographic Conference, Morelia, Mexico, pp. 161-166. Winid B. (1991) National Atlases Production in Developing Countries. A paper on 8 pages presented to the meeting of the National Atlas Commission in Leipzig, DDR, 1991.